Iran says it is ready to accept a proposal for its nuclear program that demands Tehran send its low-enriched uranium to Russia for processing. Should the global community feel more at ease? Iranian President Mahmoud Ahmadinejad, who has been engaged in heated talks with the International Atomic Energy Agency (IAEA), described a proposal presented by the UN Security Council as a move from “confrontation to cooperation” with the western powers. Russia, which has pushed for diplomacy over sanctions in dealing with Iran, has agreed to accept 75 percent of Iran’s estimated 1.5 tons of low-enriched uranium for processing into fuel rods, which cannot be used for the production of nuclear weapons. “We welcome fuel exchange, nuclear cooperation, building of power plants and reactors and we are ready to cooperate,” Ahmadinejad announced in a televised speech in the city of Mashhad, as quoted by AFP news agency. UN nuclear chief Mohamed ElBaradei has not released exact details of the agreement, but diplomats say it calls on Iran to hand over 1,200kg of the low-enriched uranium it has to Russia by the end of the year. The processed uranium will then be shipped to France where it will be converted into fuel plates. Russia would enrich the low-level enriched uranium to the 19.75 per cent needed to power a research reactor that makes radio-isotopes for medical use. Iran’s declared willingness to send its enriched uranium to Russia for processing has been presented as a way to curb Iran's ability to build a nuclear weapon, which it denies it plans to do, as well as diffuse a tense stalemate brewing between Iran and Israel. Ahmadinejad, while declaring his support for the plan on the one hand, continues saber rattling against Israel on the other hand. The Iranian president commented on Tuesday during talks in Tehran with Turkish President Tayyip Erdogan that as long as Israel was in possession of nuclear weapons, Iran would not halt its nuclear program. “When an illegal regime possesses nuclear weapons, the other countries’ rights for peaceful nuclear energy cannot be denied,” the Iranian news agency ISNR quoted Ahmadinejad as saying. 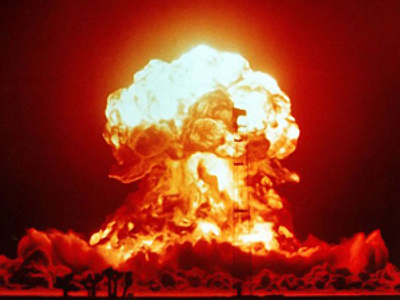 Israel has never confirmed or denied that it has nuclear weapons. President Erdogan told his host that relations between Ankara and Jerusalem have remained strained following the Turkish president’s harsh condemnation of Israel’s behavior during the Gaza War in December, which killed over 1,000 Gazan civilians and left some 400,000 Gazans homeless. Israel defended their actions, saying Gaza used "human shields" around their military installations. Tehran attracted heightened suspicion to its nuclear program when Iranian officials revealed to the five permanent members of the UN Security Council – Britain, China, France, the United States and Russia – about the existence of a uranium plant near the city of Qom. The Fordo plant, built into a mountainside near the city of Qom, was previously secret, although western observers say Iran made the decision to go public about the nuclear plant when it discovered western intelligence agencies had discovered it. On Sunday, a team from the IAEA carried out an inspection of the plant. “We had a good trip,” announced delegation head Herman Nackaerts, who refused to answer specific questions about the data collected at the site. The Iranian president then made reference to ongoing nuclear projects that have been in the works for decades. The Iranian president made reference to the Bushehr Nuclear Power Plant that was begun by German companies in 1975, and was scheduled for completion in 1981, but work came to a sudden halted due to the eruption of the Iranian Revolution of 1979. Russian company Atomstroiexport took over the contract in 1995, but a series of delays, as well as concerns over Iran’s true nuclear ambitions, once again put the massive project on hold. Some nations, most notably the United States and Israel, believe that Iran is pursuing its nuclear program in order to build nuclear weapons. Tehran denies the charges, saying it needs nuclear energy for purely civilian purposes. A big win for Russian diplomacy? Although everybody continues to hold their breath as to what “important changes” Tehran may demand in the agreement, so far it looks like Moscow has chalked up a major diplomatic win over the “Iran question” and Russian media is basking in the victory. In the past, the talks often ground to a halt over difference of opinion on how to get Iran to come clean with its nuclear program. Russia, together with the heavy support of China, endorsed diplomacy over sanctions, whereas Washington seemed to favor the strong-handed approach, complete with economic sanctions and a heightened atmosphere of animosity in the region. But things slowly started to change with the election of US President Barack Obama, who spoke of “sitting down and talking” with Ahmadinejad, an approach that the Bush administration, which had ranked Iran amongst the so-called 'axis of evil', had completely ruled out. 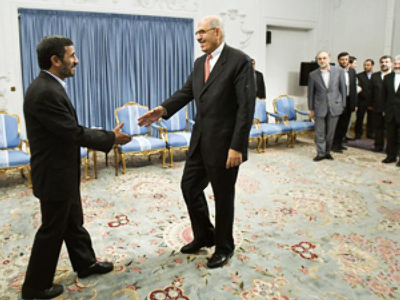 Perhaps Ahmadinejad, despite his occasional diatribes against the west and Israel, came to the conclusion that this was his last opportunity to exit from the nuclear standoff in a face-saving manner, while detonating tensions with Israel, which has threatened to take unilateral action against Iran if it continues with its nuclear program. On Wednesday, Tzipi Livni, the leader of Israel’s biggest opposition party, Kadima, was in Moscow for talks with Foreign Minister Sergey Lavrov to discuss ways for finding a “political settlement” to the Iranian nuclear issue. “Lavrov confirmed Russia’s principled support for the political and diplomatic defusing of the situation related to the Iranian nuclear program… with representatives of Iran in Geneva on October 1,” a Russian Foreign Ministry report on the meeting says. Against the background of the Iranian announcement on the nuclear agreement, the U.S. president’s national security adviser, General James Jones, is in the capital for nuclear arms reduction talks. Welcoming the U.S. general, Lavrov said the visit was “very timely,” and would “allow us to fulfill our presidents’ agreements to sign a new START treaty by the time the current treaty expires” in December. Barack Obama and Dmitry Medvedev are working on the details of a new Strategic Arms Reduction treaty, which has been described as the “pillar” of Russian-US disarmament commitments that expires on December 5, 2009. Analysts are hopeful that with the possibility of a nuclear-armed Iran behind them, Russian and the United States will have fewer distractions come December and yet another diplomatic win can be achieved.